How would you plan your retirement if you had already received a degree from Wellesley College, earned a further degree in Russian and Middle Eastern Studies, hitchhiked to Morocco, lived in Paris, worked for the United Nations, as well as in the cable TV world, and for the Christian Science Monitor newspaper? Sue Bridge, with the urging of a Northampton friend, bought eight acres of hilly land in Conway. For the past seven years her retirement project has been to create a sustainable, self-sufficient home and landscape where she can live off the grid. The house she designed is energy efficient, well insulated with electricity and hot water provided by solar panels. It is also beautiful, inside and out. The sunny main living space is comprised of a kitchen, dining and living areas. French doors form the south wall of the living area which opens out onto a stone terrace with low stone walls overlooking terraced gardens and across to the hills beyond. The house is small but there is no sense of being cramped, only of spacious comfort. For help in creating a sustainable landscape she turned to Jono Neiger of the Regenerative Design Group. Neiger and his group are proponents of permaculture systems. Bridge confesses she didn’t really understand what that meant when she began. Neiger came several times to visit; he’d walk around, make notes and walk around some more. Finally, after he had walked the land for several months and not a single spade of soil had been moved, she asked him if his crews were very busy. Did he have any idea when work would begin? Then Neiger had to explain that work was well-begun. He had been building a scientific portrait of the land, how the sun, wind and water moved across the hill, and over the season. It was not until Neiger invited Bridge to his own garden that she began to understand what permaculture is. On the appointed day she arrived at his house and garden before he did and was very confused. 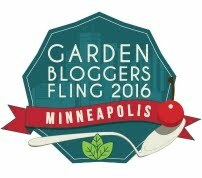 “Where’s the garden,” she asked when he drove up. The truth is that permaculture gardens do not look like the beautifully arranged flower gardens or orderly vegetable gardens that most of us are familiar with. The terraces help keep the soil from eroding, even in severe storms. “We had 17 inches of rain during Irene, but there was no erosion,” Bridge said. To the east the living room terrace is an herb garden. One of Bridge’s specialties is five-herb tea. The terraces on the south hillside are first planted to vegetables that are harvested during the summer, the next terrace on the slope is for perennial vegetables like sea kale and Jerusalem artichokes, and the third is for pollinators, bee balm, garlic chives and other plants that attract pollinators. 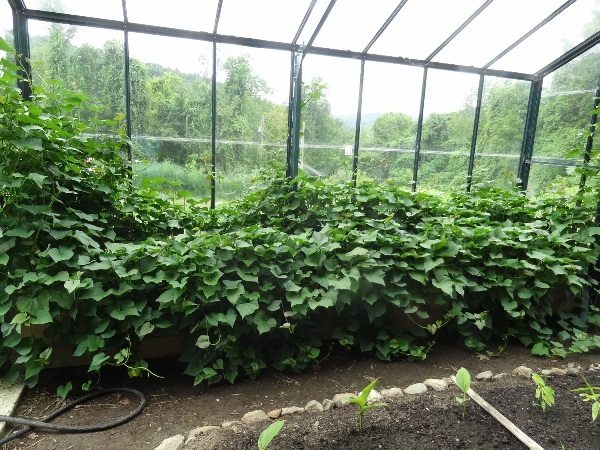 At the bottom of the slope is a small greenhouse where she grows sweet potatoes in the ground, harvesting more than 100 pounds of nutritious sweet potatoes, as well as ginger, and turmeric plants good for the digestion, and pain relief. The garden outside the greenhouse is mostly storage vegetables, beets, carrots, potatoes and squash. Of course, if you raise enough of this kind of vegetable you need a root cellar and Bridge has built a small one behind her house. Other edible crops are canned or dried. 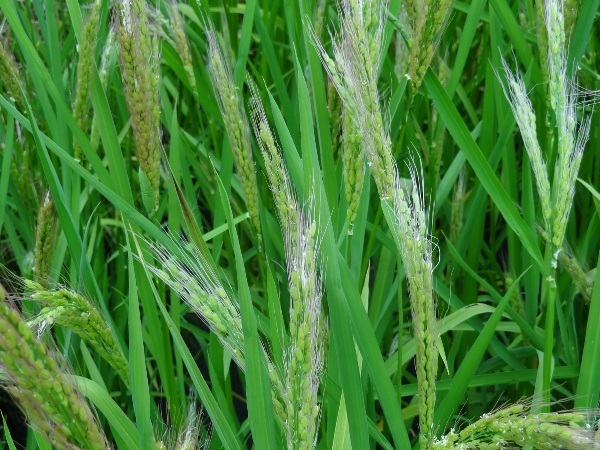 We walked past the path to the orchard with apple, peach, pear and plum trees and to the rice paddy in the Wet Meadow. It took heavy digging, but Bridge is growing rice! The land rises slightly beyond the Wet Meadow. We walked through a stand of overgrown Christmas trees, planted by the former owners, then came into a sunny meadow where nut trees, including chestnut have been planted. The surrounding evergreens help protect them from high winter winds. Bridge said she learned that eastern slopes are ideal for fruit trees and berries. On her eastern slope she grows persimmons, pawpaws, quince, Asian pears, shadbush, blueberries, elderberries, and black chokeberries. http://www.millernurseries.com/ sell chokeberriess. Chokeberries are not very sweet, but they are extremely nutritious and do make good jelly. 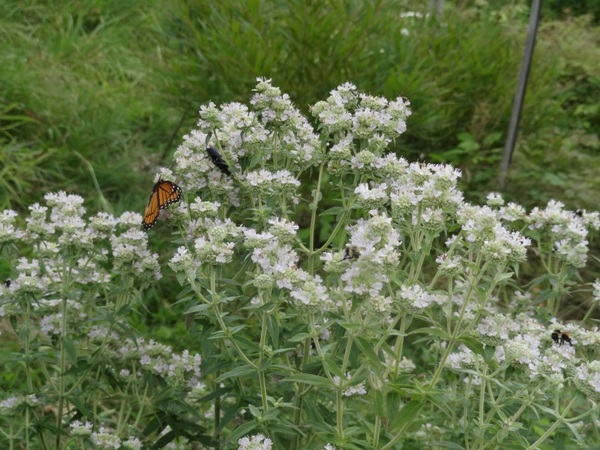 Bridge has also tucked mountain mint and other plants for pollinators everywhere on this east slope. I was fascinated by the “fertility bed” a long row of comfrey, bush clover and switch grass which Bridge cuts down twice a year and uses as mulch or compost. Bridge has come to love Conway where she has found a great community with lots of grass roots action. “This is a friendly environment for me,” she said. A broad community has found Sue Bridge to be very friendly, and inspirational. 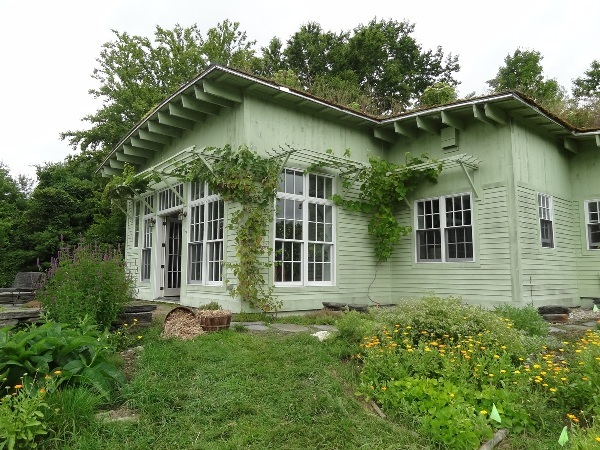 Her gardens have become a model of sustainable food production. Students from Wellesley and Smith Colleges, the Conway School of Landscape Design, Greenfield Community College and others come to see what she is doing and learn about the science behind what she is doing.